The primary reason for the failure to produce wealth in India is incompetent governance, myopic leadership, and bad policies. It is time we — all of us — took up the challenge and changed India’s direction with a new model of governance and politics. This is a revolutionary idea that can eliminate poverty, create crores of jobs that young India so desperately needs and make government more effective. Dhan Vapasi is the solution which can finally give all Indians the freedom to chart their own course to wealth creation and prosperity. What is Nayi Disha? Who are the people behind it and what do you plan to achieve? Nayi Disha is a platform to bring together Indians who wish to make India prosperous. The core objective is to unite citizens on an agenda of freedom, equality and wealth creation. Nayi Disha’s 5 Prosperity Principles and 5 Starting Solutions will usher in a new model for governance and politics in India. Nayi Disha is an initiative by Rajesh Jain, technology entrepreneur and a pioneer in Asia’s dotcom revolution. Our members include people from all walks and age of life – students, businessmen, lawyers, economists, farmers, and young professionals. What is Nayi Disha’s vision and mission? Nayi Disha believes that poverty is not India’s destiny. Our vision is to bring lasting prosperity to Indians, not in generations, but between two elections. Nayi Disha’s mission is to put an end to actions that destroy wealth and initiate actions that enable widespread wealth creation, thus making Indians prosperous. Read more about our platform and manifesto. How does Nayi Disha propose to bring prosperity to all Indians? Nayi Disha’s two key solutions – returning ₹1 lakh per year per family and capping taxes at 10% – aggregate to an annual benefit of about ₹1.5 lakh for every household. Besides putting more money in the hands of people, these initiatives will also create a safety net for every Indian family, eliminate poverty, scale up job creation, reverse the growth of government, and empower Indians to create wealth. This money will come from reducing government waste and inefficiency, selling or shutting down unnecessary government enterprises and by deploying unused and under-utilised resources. The 10% cap on taxation will ensure that there are enough revenues to support government’s need, but not its greed. Why should I join Nayi Disha? You must join Nayi Disha if you believe that poverty is not our destiny. And if you believe that we, the people of India, have the important duty of making India a prosperous and modern nation. If you believe in our prosperity principles and wish to be a part of this change, be a part of Nayi Disha. Be a part of our vision. Become a volunteer. India is one of the richest countries in terms of mineral wealth and other natural resources. Analysts have estimated the total mineral wealth of the country to be more than ₹ 5011 lakh crore. Nayi Disha estimates that the government of India holds unused public lands over ₹ 300 lakh crore. Even if we take a very conservative value of 20 % of our mineral wealth i.e. ₹ 1000 lakh crore, we have public wealth of ₹ 1300 crore. This is sufficient to pay every Indian family ₹ 1 lakh every year for at least 50 years. The monetisation of public wealth and its subsequent return to the people is more a question of political will than that of the legal mechanism. As far as legal provisions and policies are concerned, the monetisation of public wealth would not be hard to administer for an elected government. As per the ‘Household Survey on India’s Citizen Environment & Consumer Economy’ in 2016, 99% of Indian households already have a bank account. Given the linking with Aadhar, we can identify individual account holders to ensure seamless public wealth return. What is Nayi Disha’s organisational structure? Nayi Disha’s team includes thoughtful, committed individuals from all walks of life who want to fundamentally change the way politics works in India. If you believe in the vision of Nayi Disha, become a member and work with us to make Indians prosperous. Be a part of our vision, join Nayi Disha. Nayi Disha is promising prosperity. Do you think ₹ 1 lakh per family is going to make Indians prosperous? More than 30 crore Indians live in extreme poverty. The median income of an Indian family is only ₹ 1.2 lakh per year. Return of ₹ 1 lakh to every family every year will double the income of about half of all Indian families. This is a considerable sum of money for most Indians and could help them transform their lives. Moreover, other reforms brought by Nayi Disha will create job opportunities and will make doing business much easier for all entrepreneurs, big and small. Who will buy the land and mineral resources? And why would they participate in auctions when they can easily get the land free of cost from state governments? Will foreign nationals be allowed to participate? Firstly, no state government should give away a valuable resource like land free of cost to industries. The natural resources of the state belong to the people and by giving them away for free, governments are robbing us of our rightful share. Secondly, right now there are no buyers of public resources in India due to lack of rule of law and burdensome regulations. When people have wealth and it is easy to do business, individuals and companies will start demanding the resources to use them productively. Foreign nationals and companies should be treated equally with Indians when it comes to buying of property in India. Our objective is to have the maximum return for the people of India. That said, there would be a few exceptions to the rule in resources involving national security. What will happen if we run out of the public wealth in near future? 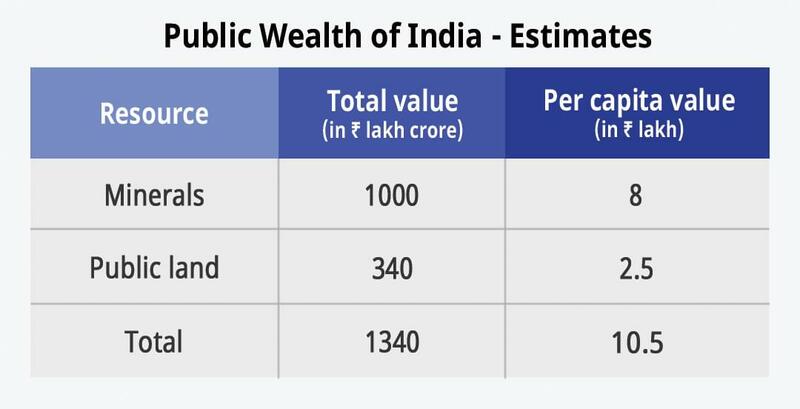 As already stated, India has public wealth that could last for over 50 years if distributed at ₹ 1 lakh per year for each family. After just a few decades of this wealth, we will not need any redistribution or welfare programs as Indians would be rich and prosperous to determine their own destiny. What will Nayi Disha do for the poor? Shouldn’t we be creating jobs for them? Nayi Disha aims to provide public wealth return of ₹ 1 Lakh every year for every household in the country, and by bringing in thorough reforms that will help in increasing economic opportunities available to the poor. This will help break the vicious cycle of poverty due to lack of opportunities, and lack of social and economic capital, that many Indians are currently trapped in. Nayi Disha recognises that in addition to public wealth return, millions of jobs are needed for Indian youth. These jobs cannot be generated unless people have the capital to start businesses and a business-friendly environment. Nayi Disha plans to liberalise the economy so that people can start more businesses and create jobs. Additionally, people can use the money for learning employment skills or education needed to get a good job. How would Nayi Disha raise funds? The initial funding for Nayi Disha is provided by Rajesh Jain. For more funds, we will soon open up to everyone who wants to contribute. This will be done in a transparent manner. You can also help by joining Nayi Disha. Who are the people involved in Nayi Disha? What are their credentials? Nayi Disha is an initiative by Rajesh Jain. Our members include people from all walks and age of life – students, businessmen, lawyers, economists, farmers, and young professionals. To grow, the movement needs several leaders, champions and volunteers. We are looking for people who can lead and take our country on the path to prosperity. How can I contribute to Nayi Disha? What will be the role of Nayi Disha members? If you are interested in our mission, do register with us and become an active member. If you feel inspired to walk towards a new direction with us, volunteer for us and spread our message, or even become our ambassador or community leader. Nayi Disha members are the architects of India’s future. Our members at all levels will be involved in decision-making and organisation. If you believe in our vision, join Nayi Disha. I am interested in Nayi Disha, but I do not yet have my Voter ID / I do not want to share my Voter ID yet. Can I still join? b) Volunteer at Nayi Disha events and meetings or even help start a local chapter. You can also earn points as you help Nayi Disha. Voter ID is important for you to have all the member privileges. As soon as you signup with your Voter ID, your activity points will be migrated to your upgraded profile. Be a part of our vision. Join Nayi Disha now. How would Nayi Disha engage with its members? Nayi Disha will engage and support its members with multiple digital platforms including the Nayi Disha App, blogs, forums and extensive use of social media on Facebook, Twitter, Instagram, WhatsApp etc. As support for Nayi Disha grows, we will also have local chapters which will organise regular meetings and events. Be a part of the Nayi Disha team. Join now. Have more queries. Visit FAQ.